The Morley Court Roof Garden project in Plymouth, has been ‘highly commended’ in the ‘Best Community Project’ category by judges of this year’s Abercrombie Awards. IKO PLC was responsible for the design and installation of the new waterproofing system for the roof garden, after the existing one failed. Morley Court consists of a series of shops at street level and blocks of flats built in the 1960’s and 70’s. 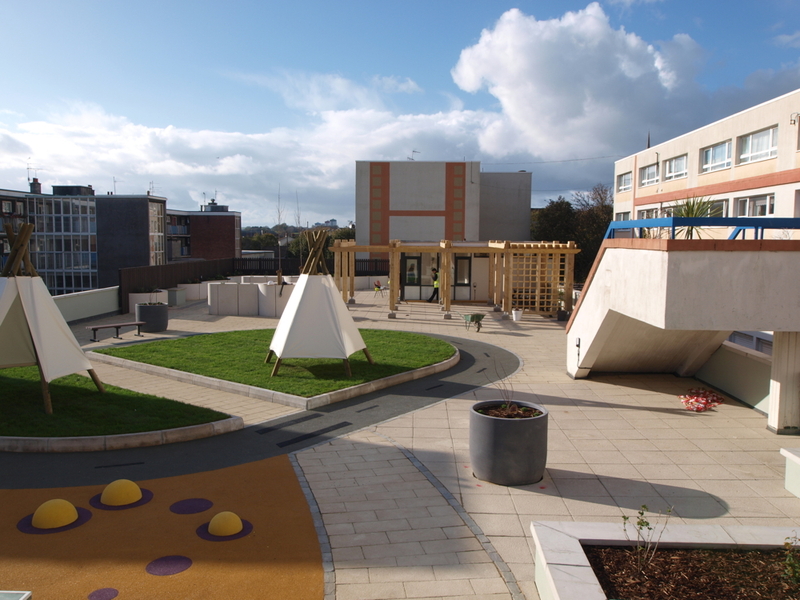 The complex incorporates a covered car parking area and a much under utilised communal roof garden. Over time the roof garden had suffered degradation of the waterproofing layer. An insufficient gap between paving slabs and substrate, and rusted rainwater gullies had lead to water penetration from the terrace into the car parking level. Ponding was also prevalent after heavy rain and the painted steel guarding has been affixed directly through the parapet wall, leading to failures in the render due to freeze – thaw action. Following a detailed roof survey by IKO’s technical team, the recommended waterproofing solution included an IKO Systems Vapour Barrier, IKO Enertherm Alu Insulation to bring the roof up to the required standard of energy efficiency, IKO Systems S-A Underlay and IKO Systems T-O Underlay for detailing. The system was finished with an IKO Superflex Root Barrier layer, ready to take the final hard surface, which consisted of a mix of hard and soft landscaping. The result was a high grade waterproofing solution with a 20-year single point guarantee and 0.18 U-value. IKO’s approved contractor, Western Flat Roofing, carried out the installation.